I've steadily been seeing a decline in the sync speeds on Zen's portal and was curious to see if the FRITZ!Box and g.inp would improve this and as far as I can tell the ECI does not fully support g.inp and FRITZ!Box allowed me to consolidate everything into one box. 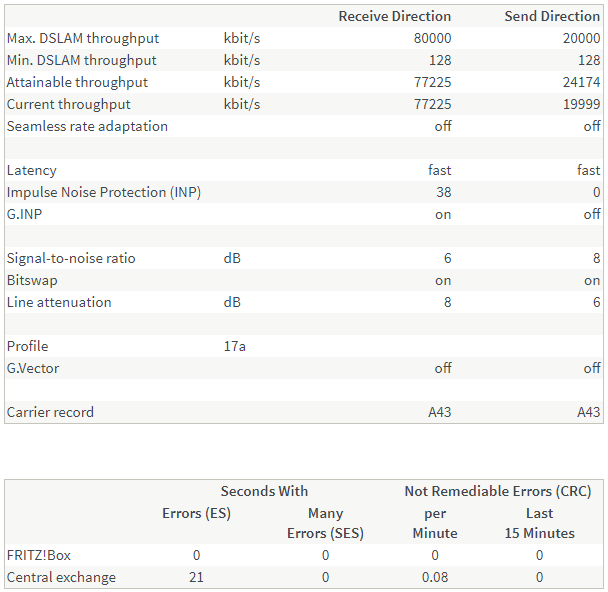 Since connecting the FRITZ!Box the sync is more or less equal to the ECI and speed tests are close, but slower by 1-2Mb/s. 1.) Would I be correct in assuming there is a possibility that G.INP will at some point activate now that the modem on my line supports it, or would this require a DLM Rest? Also is there anyway of telling if this would increase the sync speed or is it more a wait and see what happens if/when g.inp is activated? i assume you mean you had been experiencing decreasing speed with the ECI modem, not since replacing the combo with the Fritz box. 1) The Fritz box is reporting you are on Fast Path in both directions. AIUI it G.INP is only implemented to remove the sync and latency penalties incurred by the normal interleaving/error correction routine if that has been invoked. Unless the box is falsely reporting Fast Path which is unlikely I don�t think G.INP will be applied. It doesn�t basically add speed, it restores it. 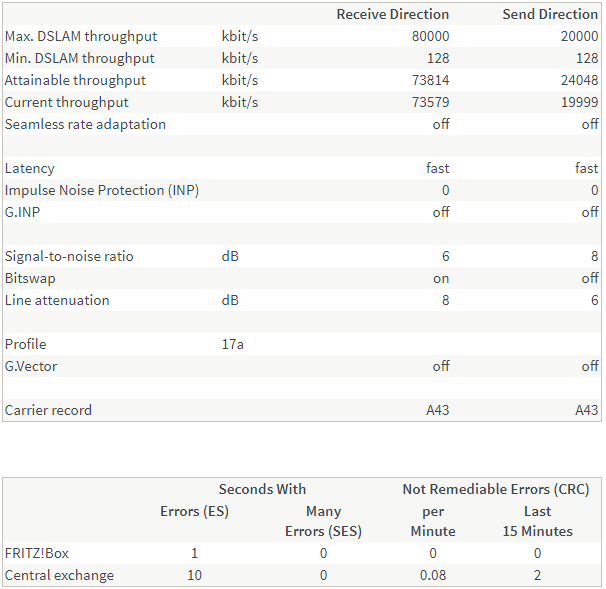 I think your loss of sync was probably due to crosstalk from additional FTTC connections on your cabinet. 2) G.Vectoring is only used by Openreach on G.Fast enabled cabinets. (There would be a box with air vents physically bolted on to the side of the phone cabinet (PCP) itself, not to the FTTC cab in order to supply G.Fast). Vectoring is part of the G.Fast specification, essential in order to achieve its high speeds of up to 300Mbps. I think the theory that it is only deployed to raise the average speed to 24 Mbps is almost certainly an internet myth. What is true is that it is not deployed on all cabinets, but I don�t know what the criteria are. 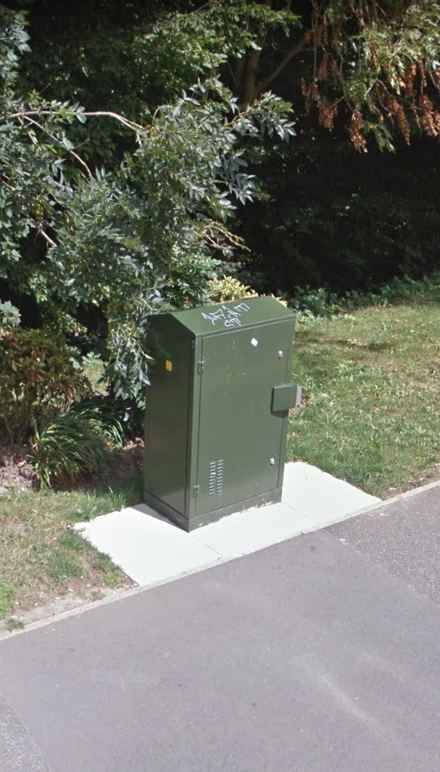 The original Openreach deployment concept was apparently to have the G.Fast boxes closer to the premises covered by the cabinet, to add higher than 80Mbps in the whole area, but that I believe has been dropped as pointless high expenditure that would be better spent over time replacing FTTC by FTTP. A long time! "2) G.Vectoring is only used by Openreach on G.Fast enabled cabinets. (There would be a box with air vents physically bolted on to the side of the phone cabinet (PCP) itself, not to the FTTC cab in order to supply G.Fast). Vectoring is part of the G.Fast specification, essential in order to achieve its high speeds of up to 300Mbps." You've forgotten about the limited use of vectoring on VDSL2 cabinets in some BDUK areas - cost of extra card to run the vectoring engine. VDSL2 vectoring is enabled on some BDUK cabinets where longer lines can benefit. 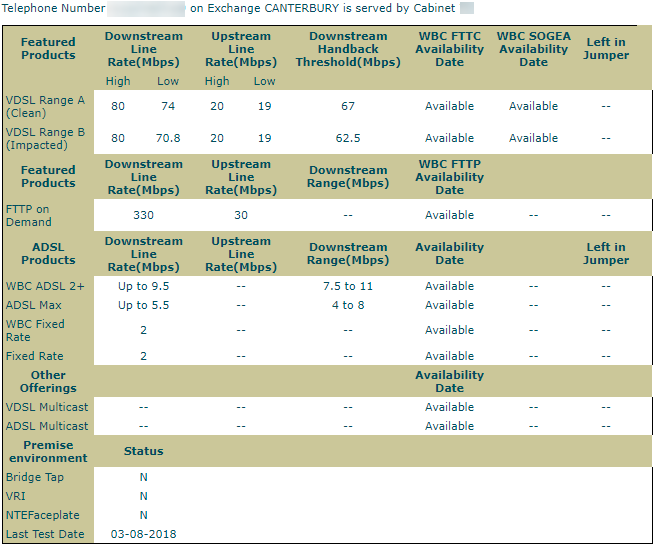 In my village most of the outlying areas have FTTP available so vectoring is not enabled on my cabinet but I sync at 80/20 anyway. You seem to be mixing up vectoring on G.Fast which is mandatory with VDSL2 where it is enabled on some cabinets which all seem to be BDUK provisioned so there must be a reason for adding vectoring to these cabs, presumably to get higher speeds on longer lines. G.Fast from the pole or DP is a completely different kettle of fish so I don't quite understand why you have mentioned that.
. (The R7000 does not support multiple WAN IPs nor IPv6 if I need it. Which is a pity as its pretty good otherwise.. I have the R7000 too and since I put the latest firmware on it now (finally!!!) works with IPv6. I had indeed Andrew. Oops . Next question though is whether or not the OP is on a BDUK-funded cabinet. Because the fact that it had originally been intended may be the basis for what the OP had heard about getting average speeds up to above 24Mbps. The OP's first post said "As I'm connected to a BDUK (Huawei) cabinet"
But AIUI if vectoring is used on a cabinet it has to be activated on all lines of that cabinet. The fact it isn't on his line therefore means it isn't. At least at present. So it appears that switching the ECI modem for a modem which supports G.INP has paid off as I've not synced over 74Mb/s in years. Line was installed in Aug 2014 and synced at 80/20 exactly but within half a year was down to 69 - 73Mb/s. This is interesting, are you also on Zen? As I had the R7000 on the latest firmware (not the older ipv6 beta driver Netgear provided couple of years ago). And when I activated IPv6 on the R7000 couple of days ago it produced the same problem as in the Zen IPv6 Trial. Router receives its IPv6 address but receives no IPv6 for the LAN side. I tried multiple different IPv6 connection types non worked. From what I've read the R7000 struggled or simply could not get Dual-Stack IPv6 to function correctly. Though in my particular case my main requirement for a different router was support for a public subnet and replacing the ECI Modem and was between getting a Ubiquiti EdgeRouter X + Huawei Echolife HG612 or the FRITZ!Box 3490. And whilst the FRITZ's design is certainly not my cup of tea I'm pleasantly impressed by its rich features.